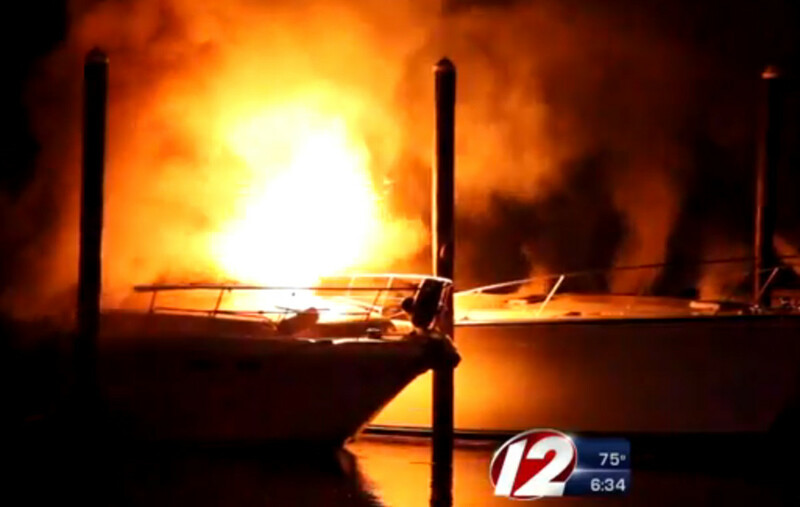 A strong wind carried the scent of smoke across the docks at the Rhode Island Yacht Club in Cranston late Saturday night as boaters slept during the first warm weekend of the boating season. One owner noticed the smoke as he put out his trash and alerted authorities. The initial report to emergency dispatchers was one vessel in flames. Firefighters arrived less than four minutes later to find four boats on fire and seven people stranded on the docks, Cranston Deputy Fire Chief Paul Valletta told the Providence Journal. They used the city’s fireboat to rescue seven people caught on the wrong side of the blazing docks and boats, Valletta said. It took 90 minutes for firefighters to tame the fiercest flames and three hours to extinguish everything. The club’s commodore, Robert O’Brien, identified the scorched boats one by one without naming their owners.